Desai Group - Creating landmarks. Not just buildings: DD buildings are not just concrete blocks. They are perfections in art, faultless in amenities and strategic by location. 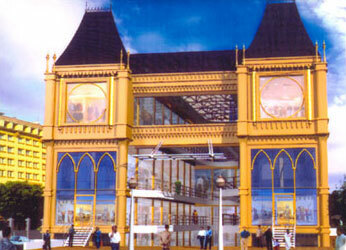 Some of the busiest shopping centers of Kochi are built by Desai Group. No other builder in Kerala can claim a record of so many successful projects as DD complexes. Whether it is DD Angadi at Market Road, DD Bazar at GP Road, DD Junction on MG Road, DD Texworld at Market Road or DD Milestone at Kadavanthara, one thing everybody will agree, these today are some of the most popular shopping destinations in Kochi. The other prestigious projects are DD Retreat, one of the South India's finest family clubs, DD Village and DD Woods - two outstanding residence projects. During the years, DD group has won the trust of Kochi's intelligent business men by timely delivery and superior after-sales service. And we now announce our latest project, Jacob's DD Mall. Jacob's DD Mall: There are many things that make every DD project so unmatched. Unique by design, International styling, world-class amenities and selection of the most strategic location in the city are the main factors that make it a businessman's first choice. Jacob's DD Mall is no exception. Mall is a vast shopping area with all shops facing a large common open space. This popular concept of big metros and abroad, is now being introduced on M.G. Road, Kochi. Now you can own a shop in a Mall. Design & Styling - So Unique: Inspired from the classic European architecture of the golden past, this building is an unmatched and outstanding one, not just in Kochi but may be in this whole country. And we need not tell an intelligent businessman how this uniqueness will give his shop or business center an unmatched identity. As every other DD complexes, this one too will be perfect by styling and finish. Location - Remarkably strategic: Coming up at Shenoy's Junction on M.G. Road, one of the nerve centers of the city, Jacob's DD Mall will provide the business solution many were looking for long. Being one of the busiest junctions in Kochi with KSRTC bus stand and both the city's railway stations nearby, this location offers a lot of business opportunities. And this junction is one of the favourite leisure time hangout of families and the youth with its cinema halls. Amenities - That matches every demand: Jacob's DD Mall will be having all modern amenities and excellent parking space spread over 4 floors of 34,000 sq.ft area with a unique front elevation, this mall has got underground parking facility, granite / vitrified flooring, spacious passages and automatic standby generator. In short everything to give your business an instant growth. A perfect home for your business: Jacob's DD Mall has an answer to your need, how small or big it may. Shops and business spaces starting from 200 sq.ft are available here. Whatever may be your choice of business, Jacob's DD Mall could be a perfect home for it. It's apt for Textile Shops, Jewelleries, Home Appliance Showrooms, Ice cream Parlours, Internet Cafe, Fancy Stores, Gift Shops or any other innovative business concept in your mind.